Rebecca, originally from Co. Mayo, is an Instrumental and Foundation music tutor with Music Generation Wicklow. Rebecca started learning the violin at a very young age and grew up playing with various orchestras in Co. Mayo. She went on to teach with Mayo Youth Orchestra where she developed a passion for music education. She studied Music in UCD and played with UCD Symphony during her time there. She went on to study for a Diploma in Community and Group Music Teaching in the RIAM. 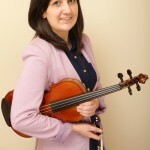 In 2010 Rebecca set up a whole school violin programme in Rathnew, Co. Wicklow which she is still co-ordinators today. Every student in the school from Junior Infants upwards receives a weekly class violin lesson. Her passion and knowledge of the violin, combined with her ability to win rapport and communicate effectively with pupils, have played a vital part in the programme’s success. Along with this Rebecca teaches with The Mobile Music School, delivering classroom music tuition in primary schools throughout Dublin.